New Winter 2018: This lovely kneeling angel is one of the popular designs from well-known artist Susan Lordi. 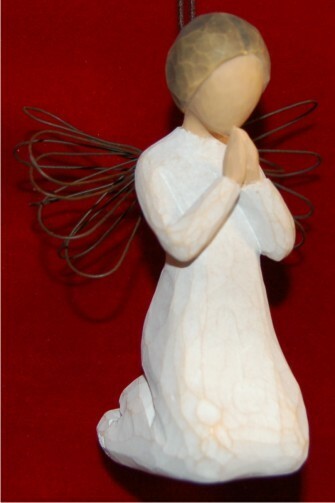 The angel of prayer Christmas ornament features a being with angelic wings bowing in prayer with folded hands. The gesture gives peace and assurance to recipients that a guardian angel is keeping watch over them, and this angel ornament is a source of comfort to people of many faiths. All Willow Tree ornaments from Russell Rhodes are crafted from durable resin based on hand-carved designs from the artist. Choose an image of peace and comfort for your holiday display or share it with family and friends in a lasting, loving way with the angel of prayer ornament.